Way back in 2013, we wrote an article on Habrahabr (Russian) about Bitcoin mining. The main idea was that there was little profit in mining due to the difficulty of the algorithms. Things haven’t changed much up to now, and the market has been overtaken by mining behemoths from China, who operate mining farms the size of aircraft hangars. In this article, we’d like to retract our statement and say that, for the time being, mining can be and is in fact profitable. The past six months have seen a variety of changes on the cryptocurrency market; a plethora of new currencies have popped up. These altcoins, as they’re referred to, include AmberCoin, ArgentumCoin, SibCoin, CannabisCoin, DashCoin, and more. They’re not that big, but they have their place on the market. This price increase is correlated with the growing demand in the cryptocurrency community. 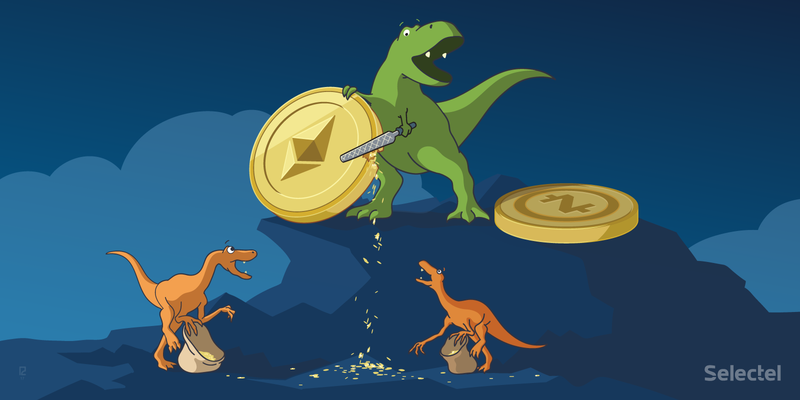 The number of miners has grown due to the sharp jump in cryptocurrency exchange rates over the last few months, namely that of Ethereum, which has increased 6-fold over the past six months. Other currencies like ZCash have also shown positive growth. For a long time, the task of mining cryptocurrency rested on the shoulders of processors, which were able to handle the workloads; however, in time the processing power proved insufficient. This has to do with the mining algorithm: the algorithm is built so that with each iteration, it becomes more difficult and requires more computing resources. For example, at the time of writing this article, the Bitcoin network difficulty stands at 711,167,198,174. One difficulty is the equivalent of one target, namely generating the necessary block signature, for which a miner is rewarded in the form of a bitcoin. Difficulty is the main indicator that determines how easy it is to detect and sign a block on the network. Networks, like Bitcoin’s, were designed so that blocks could be found once every 10 minutes. For the miner to generate a signature, or more specifically for the hardware he’s mining on, it requires, on average, (232 * difficulty) attempts. We also have to keep in mind that network capacity is growing, and this growth has to be compensated for somehow. To do this, we introduce the concept of network “difficulty”. This has led to new solutions appearing on the market, namely ASIC processors, whose architecture lets you efficiently continue mining with high computing performance. The cost of such processors fluctuates from 1000 to 2500 dollars. However, interest has recently shifted to video cards, which offer higher efficiency due to their architecture. Video cards are more efficient than standard processors, worse than ASIC solutions, but 30-70% cheaper. And so you’ve decided to start mining at home. You have the video cards you’ll use to assemble a mining station. You’ve found all the instructions, FAQ, etc. that you need. The Mh/s (megahash per second or “number of solutions per second”) were achieved using the software overclocking (acceleration) utility MSI Afterburner. Every machine uses around 1 kW/h of energy. The test was conducted on Ethereum, the second most popular cryptocurrency after Bitcoin. At the moment, a “coin” can be mined in 3-4 days; however, this period is stretching to 5 days (due to the aforementioned difficulty). At the current exchange rate to USD and considering mining difficulty, we turn a daily profit (from each machine) of 0.18795208 ETH, which equals $53.383270. At Selectel, we have an inventory of Geoforce GTX 1080 video cards. According to the multitude of benchmarks and results of our own tests, these video cards offer a decent means of establishing a passive profit. We’ve also looked at tests on currencies like ZCash, Vertcoin, and MonaCoin. Why these in particular? The GTX 1080 video card solves the algorithms for these cryptocurrency tasks more efficiently. Other currencies showed lower or negative profitability. Under Custom Servers, you can assemble your own mining station with the number of video cards you need. At the time this article was written (27.06.2017), one video card yielded a possible 185-220 USD a month. Consequently, one server with 8 video cards means you can theoretically earn 1500-1700 dollars a month, which earns you back your initial investment in 1 month.